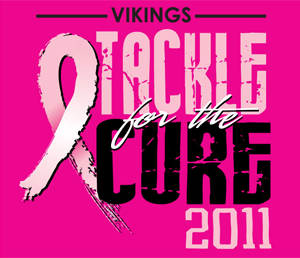 Student Council will be selling pink Tackle for the Cure shirts to Pink Out Merril Green Stadium. As the scent of pumpkin pie fills the air and the leaves begin to cover the ground, the colors of brown and pink instantly come to mind. Pink, a color that may initially seem odd for autumn, will fill Merrill Green Stadium on October 28 in support of breast cancer awareness. The central goal of Pink Out is to essentially paint the stadium pink. For the crowd in the stands, Student Council will be selling Pink Out T-shirts. Although Pink Out serves as a way for the Vikings to donate to a global foundation, the event is also an important way to give back to people in our own community. Not many students tend to think about their future, or could even begin to imagine battling a disease, but the reality is that people in the community are suffering from cancer. Students are encouraged to stand out, and stand up for breast cancer and make it a priority to raise awareness.